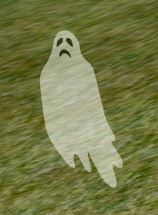 Ghosts were introduced into Egypt on October 21, 2018, with the System message "Spooky Ghosts have been spotted across Egypt, don't touch!" "As you reach out the ghost vanishes leaving this angry Pumpkin in its place..."
If you are wielding a knife, you have a choice of carving the pumpkin or picking it up. Otherwise, you may only pick up the pumpkin, which will go into your inventory as Spooky Pumpkin 1, Spooky Pumpkin 2, Spooky Pumpkin 3, or Spooky Pumpkin 4. Pumpkins have been carved with stone, flint, and bone knives, as well as higher quality ones. When a pumpkin is carved, it may yield special Halloween resources, such as Gingerbread Tiles, Scarecrow Stuffing, or Pumpkin Paint. "Your carving was a failure, but inside the Pumpkin you find some goodies..."
These resources can be used to build a special compound, the Spooky House. To build a Spooky House, select Projects>Compound>Spooky House. From here you'll select an orientation (North, South, East, West) for your Spooky House. 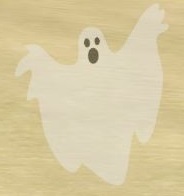 The following data has been compiled about Ghosts, the pumpkins they yield, and the goodies that have come from carving the pumpkins. Please add additional data as you discover it. This page was last edited on 6 November 2018, at 00:58.